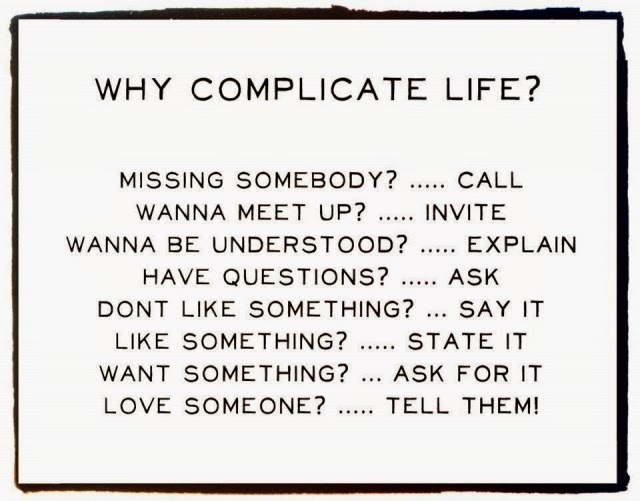 Can I get an AMEN?!!! Have a wonderful week everyone. Well, the hubby and I are settling back into being empty nesters. Baby girl has already endured 2 days of new classes and professors as well. Suffice it to say that Volleyball 101 will be a breeze...hello, 3 years of middle school ball, 4 years of varsity ball, and 6 years of club and coaching. LOL Now, Oral Rehab...that is another story. God Bless that child (and group projects...hate!!!). Last night hubby and I made a dish out of one of my "newer" cookbooks...Make Ahead Paleo. Smoky Fall Spice-Rubbed Skirt Steak...melt in your mouth fall y'all! 1. Place the rub ingredients in a small bowl, and stir to combine. 2. Cut the skirt steak into thirds so it's easier to handle on the grill. Sprinkle the rub mixture on all sides of the steak pieces. Really rub it in with your hands to distribute it evenly. Place the meat in a large zip-top bag. 1: Thaw the steaks in the refrigerator overnight. Remove the steaks from the refrigerator and allow them to warm up to room temperature. Meanwhile, preheat your grill to medium-high heat. 2. Grill the steaks for 2-3 minutes per side for medium-rare. Remove from the heat to a warm plate, tent with foil, and let them rest for 10 minutes. 3. Slice the steaks against the grain, and serve. We served a mix of grilled veggies (zucchini, yellow squash, red onion and mixed peppers) alongside. This dish really is reminiscent of fall flavors!! Enjoy. If you follow me on Instagram, simplylkjblog, you will know that baby girl and I took a road trip this past week. The end result of that trip was dropping baby girl off at the university for her Senior year! While the drive is a long one, we I had a lot of fun (when else can you hold your almost 21 year old child captive for 12 hours straight???). Despite some unnecessary lane closures road construction along the way, we made it in good time and without mom getting another speeding ticket incident. 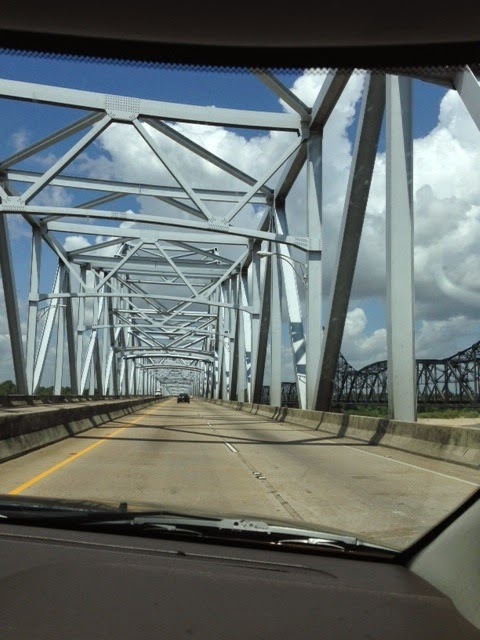 the bridge over the Mississippi River, the state line between Mississippi and Louisiana. Of course, no trip is without potty breaks (however, you had best REALLY have to go or baby girl and I are NOT stopping). Sorry for the poor quality photo...this was taken from a moving car with my phone. We have been trying to get a picture of this for the past couple years. 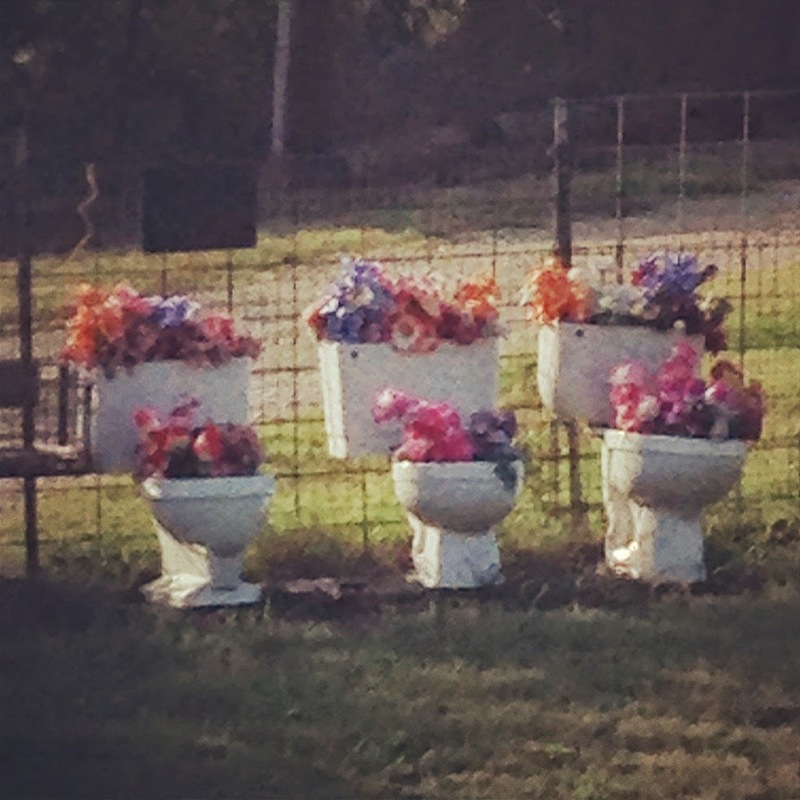 These sit outside the entrance to a ranch just outside of Waco. The last time we tried to get pictures, we had slowed down and were just about to pull over when baby girl noticed the owners pulling in behind her. LOL Oops. And Ron...I will be sure to bring one with when we come to LA next month!!! Amanda said it best, "they will look tres chic in your courtyard." Baby Girl and I had fun with our phone emojis with this one!! I will let y'all piece those together. I got baby girl all settled...groceries, clean room, books (in that order...a girl has to eat, the clean room is for mom's peace of mind, and books, well-dad would like to think that tuition $$$ is going toward something). All joking aside, we could not be more proud of her. She will finish her undergraduate degree in 3 years!!! And, grad school applications are just around the corner. 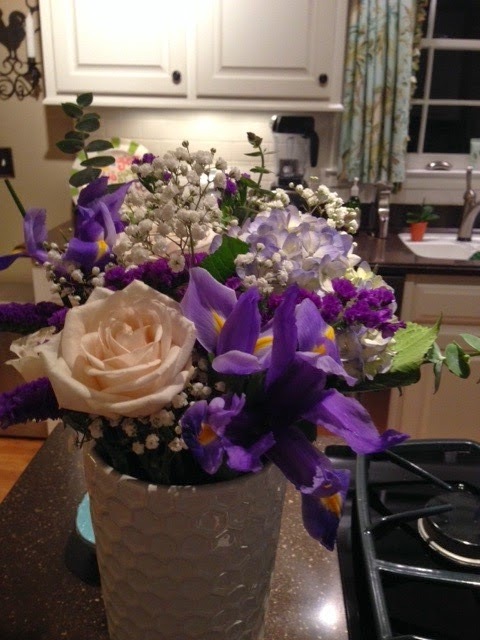 a beautiful bouquet of flowers, my favorite dish (chicken divan) oven ready, and a CLEAN HOUSE! Sorry ladies, don't hate me. Yes, he is a keeper. This week will be spent adjusting to the quiet again, and keeping our sweet Cairn entertained (she is missing her Auntie Katie, as we call her, something awful). Next week I will start my weekly Bible Study class, and teach my new group of littles for the first time. Always love getting back to those sweet little ones who are so eager to learn! Pork and fruit are just a great combination in my book, and this recipe was delicious. We used nectarines instead of apricots as our Publix did not have any on hand. I think it would be equally delicious either way. We used baby arugula as well. The recipe is from Eating Well, and can be found here. I will be taking the next few days off from blogging, as I am driving baby girl back to Texas for her final year...insert "how the heck did that happen?!!!" 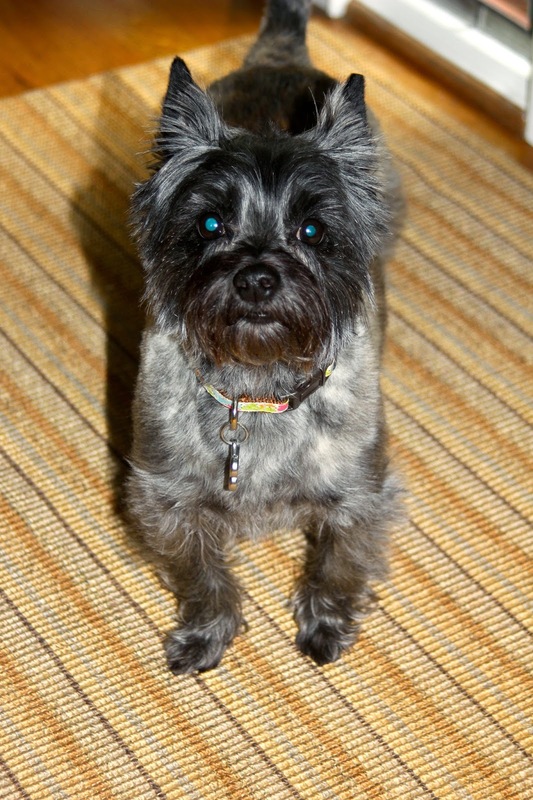 But once back I hope to be blogging more frequently this year so as not to dwell on the fact that unless you count my sweet 5 year old Cairn I no longer have a baby at home, and it will be waaaaay too quiet! Now that the paint has dried we finally got around to taking pictures, I have pictures to share. As most of you know, we replaced all the windows on the front and side of our home. The back were not in as bad a shape as most are inset in the brick or protected by the porch, and will be done down the road. 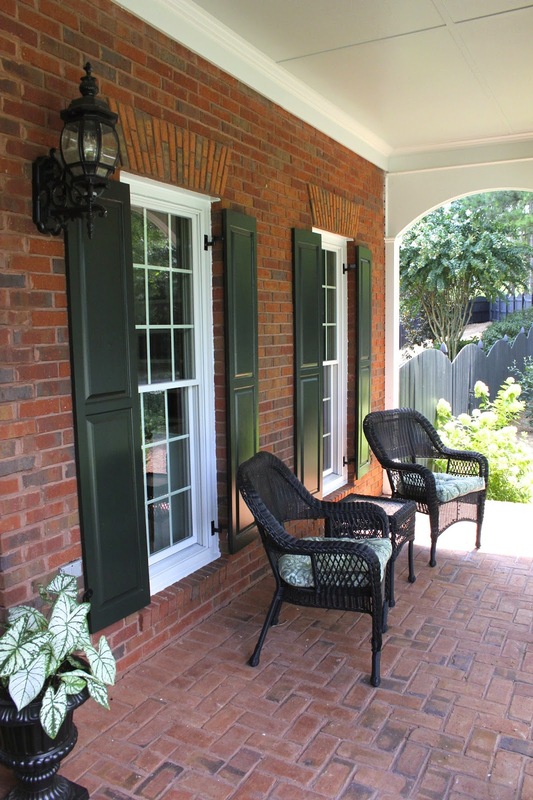 For those curious about the windows, we went with Pella's Architectural Series in Classic White (a bit of a gray white). We also chose the grids between the glass...this makes them so easy to clean, and with a little dog who loves to look out slobber all over them because our friendly crazy squirrel is tormenting her that is often on the bottom ones for sure. The windows also have a tilt feature, meaning I now have no excuse not to clean the top ones either! 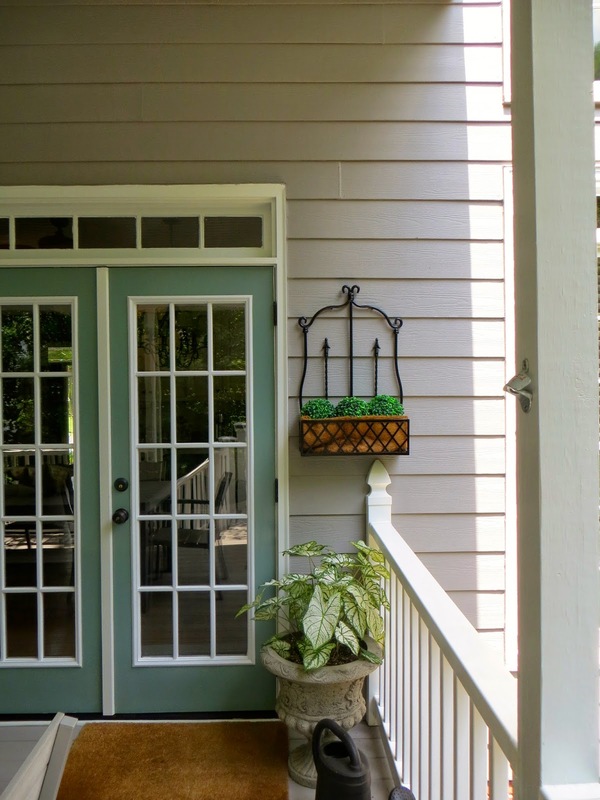 Our painter used Sherwin Williams top of the line exterior paint, Emerald, with the exception of our arbor out back in which he used their solid stain. Not a full shot of the house, but this is what it looked like before shortly after we re-landscaped the front yard in April of 2013. In the after pictures you can see how much things have grown. We have been fortunate to have had a lot of rain the past two summers. The only things we my #2 forgot to photograph were the arbor that is off to the left side of our back porch that covers our hot tub area and the porch ceilings. I am thrilled with how things turned out. 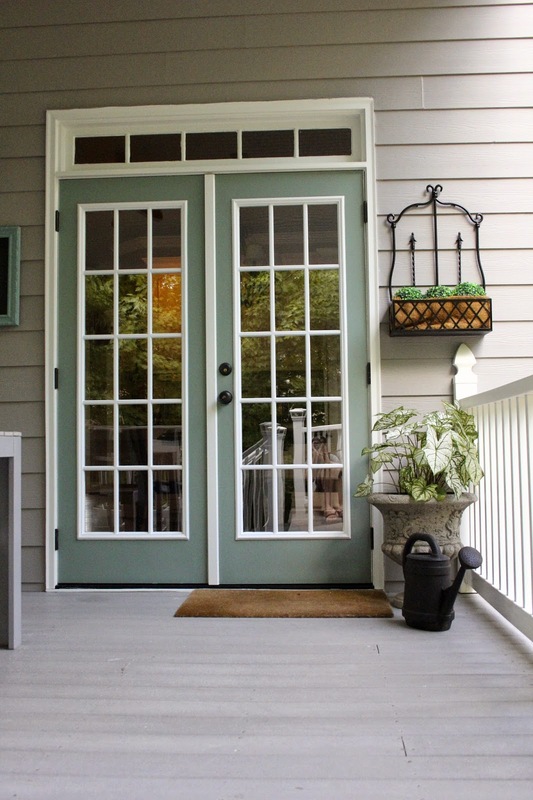 Picking colors to go on the exterior of your home can be quite daunting. So many of our neighbors are going darker, the new trend, but our home is a true southern traditional (it is actually a Southern Living house plan) and I felt the colors we chose were in keeping with that style. 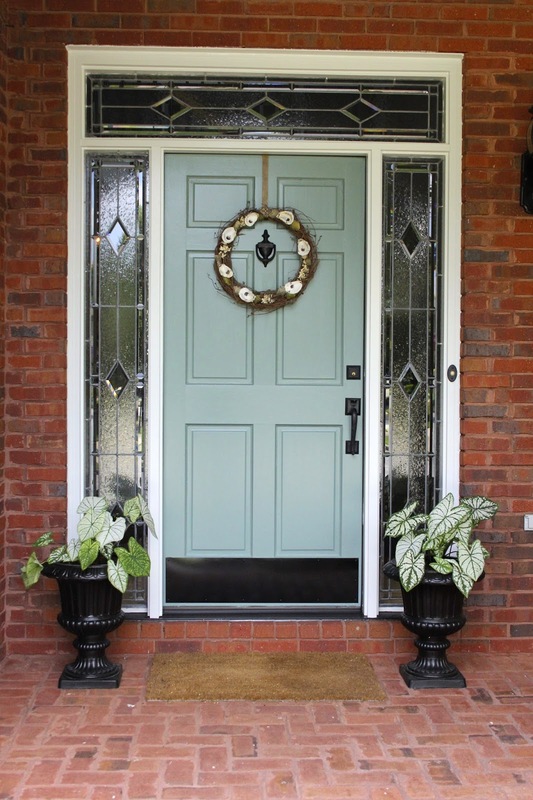 My favorite, and the favorite of most who have commented on the exterior is our door color. These are two projects that I am glad are behind us!! If you are in the Atlanta area and need a fantastic painter, feel free to email me!!! I would highly recommend ours, and have plans to use him again in the near future. There are times it can be so easy to look at our past, and dwell on it. 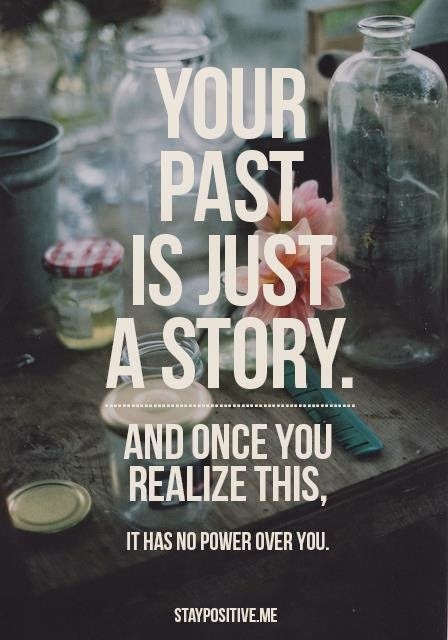 While the past has shaped and molded us into who we are today, it does not define us! Tonight it is all about comfort food. Meatloaf and mashed potatoes to be exact. But, as you all are probably aware of by now I cannot eat tomatoes (or any tomato products for that matter) due to an allergy. We stumbled upon this tomato free-gluten free meatloaf recipe, and it is AMAZING!! The recipe can be found here. You will not be disappointed. We served homemade mashed potatoes alongside the meatloaf. Okay, we can all agree that the right undergarments can make or break an outfit. Well the same goes for your home furnishings. Rugs to be more specific. Pause...if you were expecting me to talk about that kind of undergarment, sorry to disappoint. A girls gotta keep some things private. Just saying. Just like having the right undergarments for the type of clothing you choose to wear; loose, silky, fitted, etc. the right "undergarment" for your rug can make or break it as well. I have had the unpleasant experience of having a commercial rug pad sold at a big box store leave semi-permanent marks on our hardwood floors. Nothing short of having them refinished will remedy that. Also, most of the rug pads you will find on the market are thin. Adding no cushion, or "support" to your rug. We have a rug in our front foyer area that we had a "traditional" rug pad under. The rug is made of Jute and has a latex backing. We added the rug pad for two reasons, 1) to protect our floors from the latex backing and 2) to keep the rug in place. Well, while the pad appeared to protect our hardwood floors it did nothing to keep it in place. And, because it was constantly shifting the rug pad would bunch up underneath. The constant need to straighten it out was growing old. Our rug with the traditional rug pad purchased at a big box store. You can visibly see the wrinkles! And, just to keep it real...here is the reason for all that shifting. Don't let that sweet face fool you. When she gets a wild hair she does laps around the downstairs, through the hallway-into the kitchen-through the dining room-into the library and at top speed hits the rug in the foyer sending it flying. At this point I should mention it was also becoming a saftey hazard for us humans. Enter Rug Pad USA. They custom cut their Eco Cushion rug pad, recommended for hardwood floors. This rug pad has made a world of difference. Our rug now has a bit of a spring to it, no longer hard like being on concrete and it DOES NOT MOVE!!! And, in case you are wondering...yes, we had that little angel above test it out for us. But, I have to say what I love most about this rug pad is that it is made from renewable, eco-friendly materials. 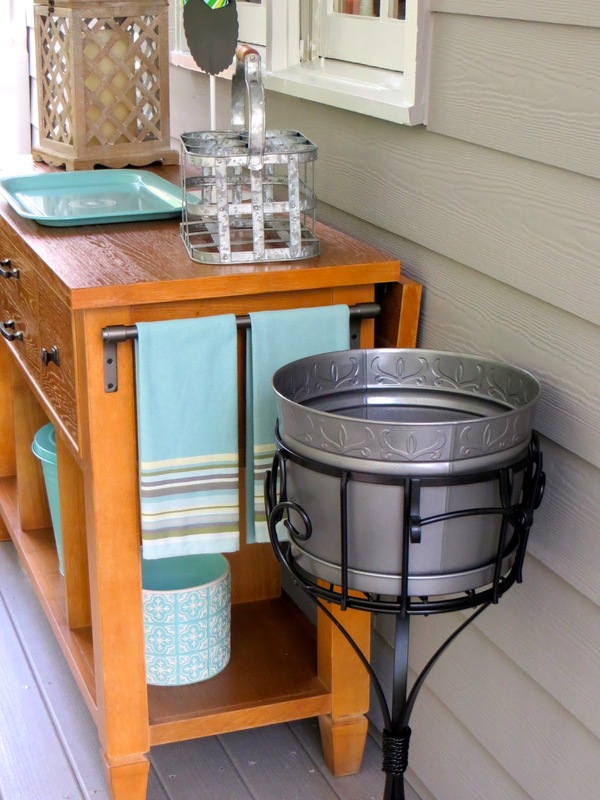 No worries about bringing more unwanted chemicals into our home. With a child with allergies who also suffers from migraines, it is important to us to provide her with the healthiest environment possible when she is home. I encourage you to visit their website and take a look around. The friendly folks are also offering my readers a 15% discount. Just use the coupon code pr15off. If you do choose to purchase a new rug pad through them, I would love to hear what you think!! Disclosure: I was given a rug pad to review but all opinions are my own and sincere. 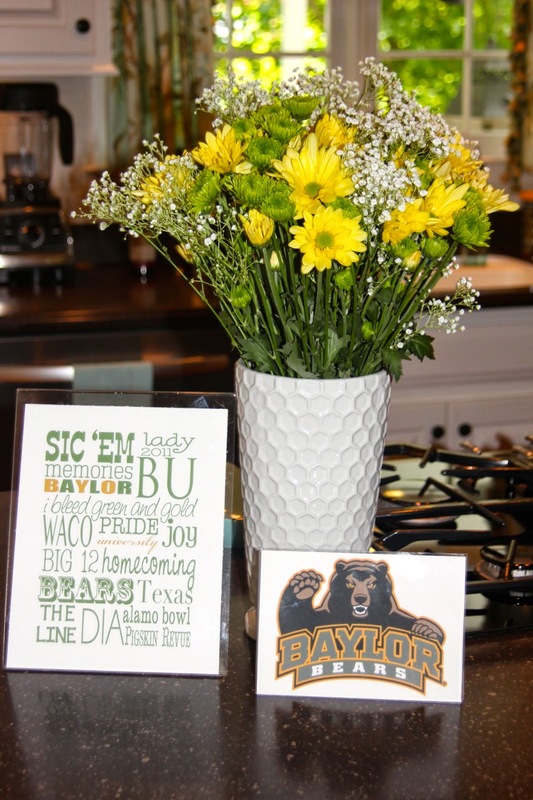 We had the pleasure of hosting the Atlanta area Baylor Send Off party on Saturday. 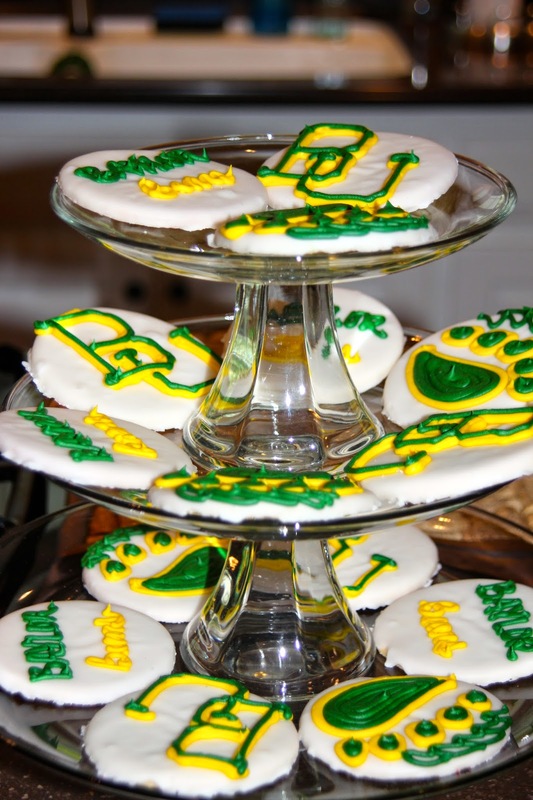 Each summer prior to students heading back to the University, a send off party is held in various cities around the states. 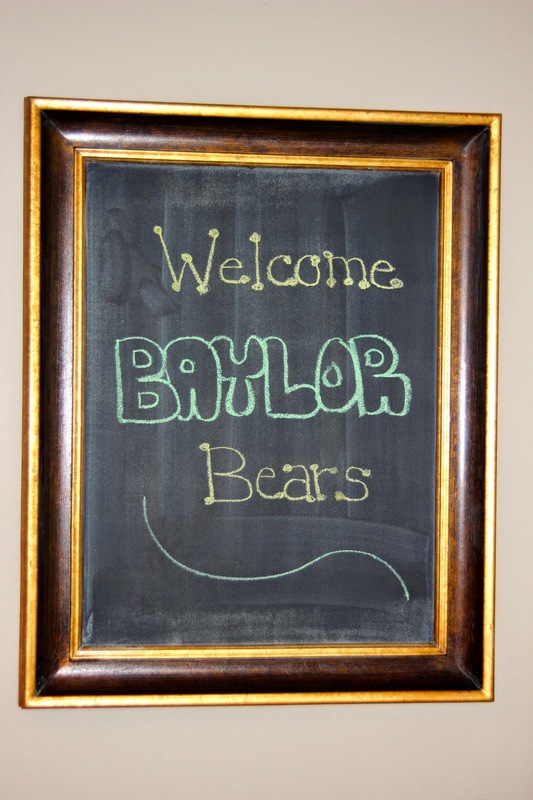 Baylor sends one or two representatives to attend the party to help answer questions parents and students might have. 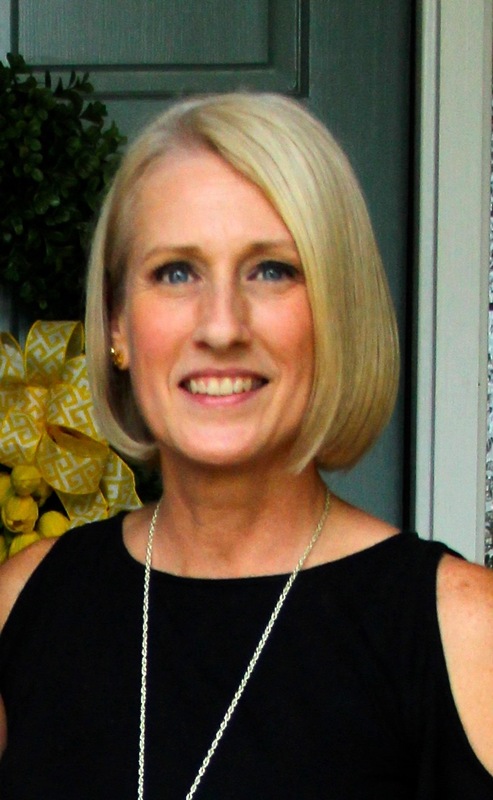 Unfortunately, our representative lost a dear friend last week and could not attend as she was speaking at her funeral. The party is a way for new students, their parents, current students, their parents and alumni to connect. It also gives new students and their parents a chance to ask questions they may have about the university and college life on the campus in general. Many express how much it has helped ease their fears of sending their child 12 hours away from home. Many lasting friendships are made as well. 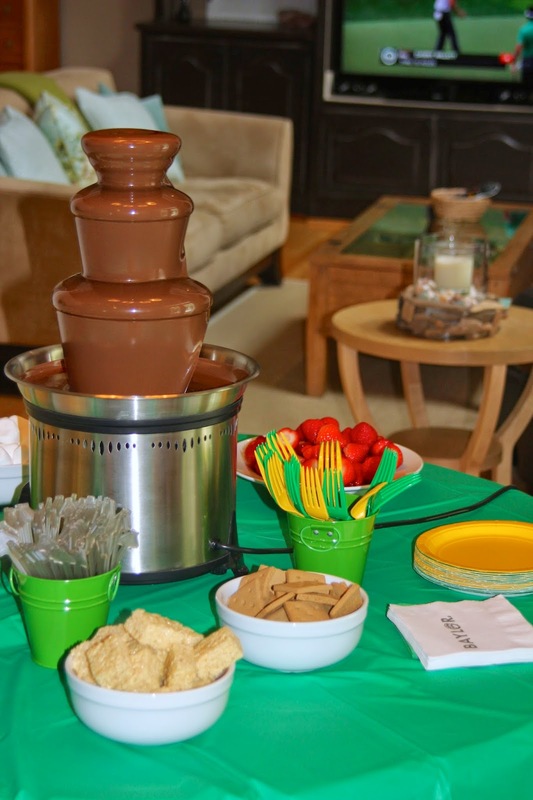 We decided to have a dessert social for our party. We lucked out in that the rain held out until after the party. The weather was perfect. 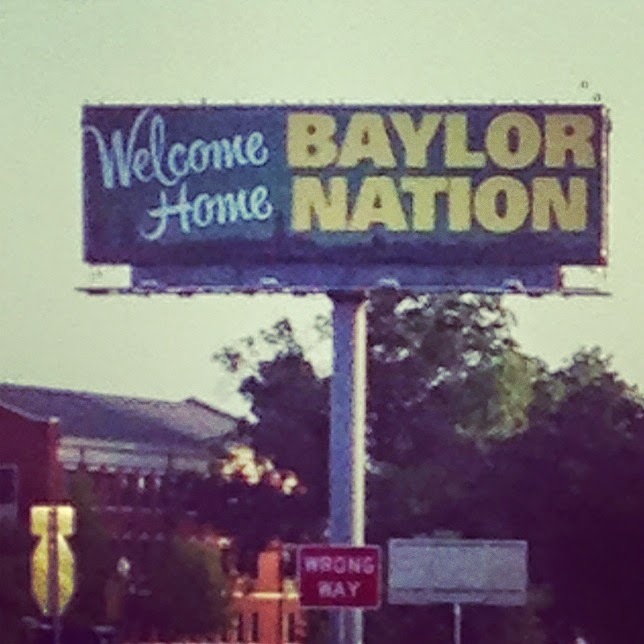 A little green and gold pride! 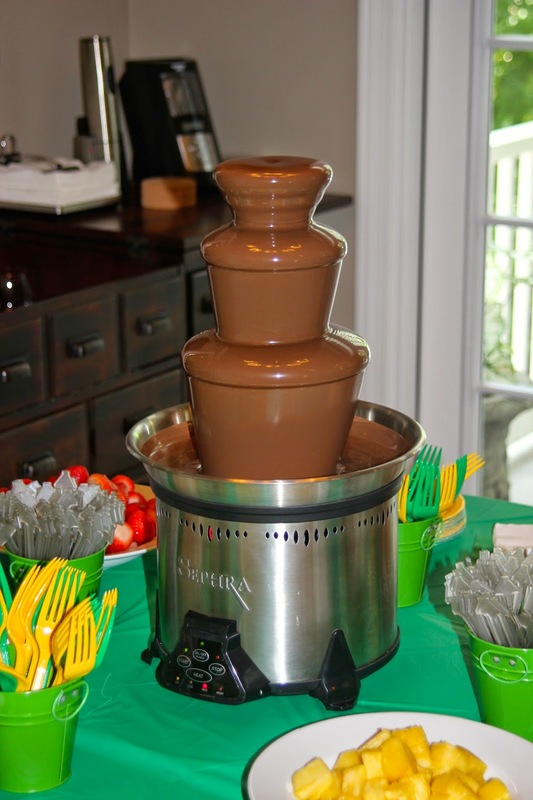 The chocolate fountain is always a hit!! We had a local bakery make the cupcakes and cookies for the party. The cupcake toppers I had leftover from our daughter's graduation party. I purchased them from an Etsy shop. The cookies were so cute! And, hard to resist. Baby Girl and I couldn't partake in them as they are not gluten free. Everyone else loved them!! If you live in the Atlanta area, I highly recommend the Patio in Johns Creek for custom baked goods. 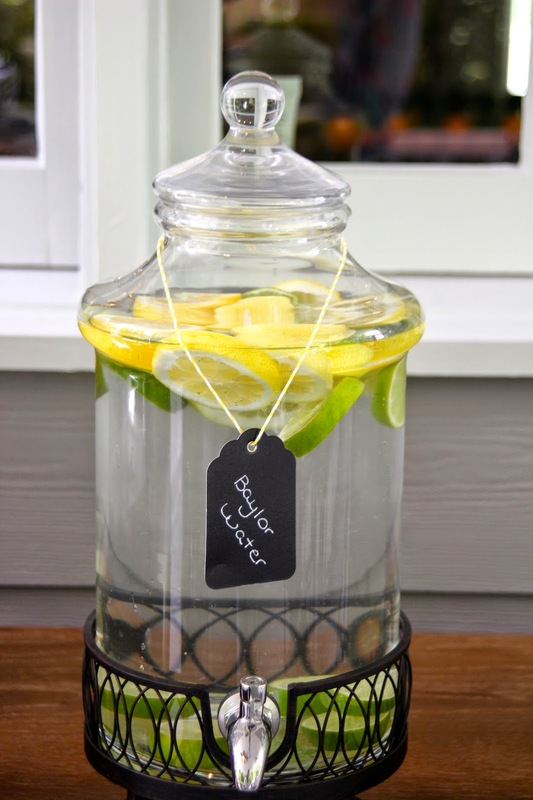 "Baylor" water...water, lemons and limes...Green and Gold!!! I put the new porch chalkboard to use as well. We had a wonderful time! Can't believe we will be heading out in less than 2 weeks!! The summer flew by, and the fact that our baby girl will be a senior (she is finishing a year early) makes it even harder to comprehend!! My friends keep asking, "didn't you just move her in for her freshmen year?" Seems like it. I promise house pictures are coming this week..."if" the rain holds off long enough!! As a mother of two now adult daughters, I think this is an important lesson to be learned. 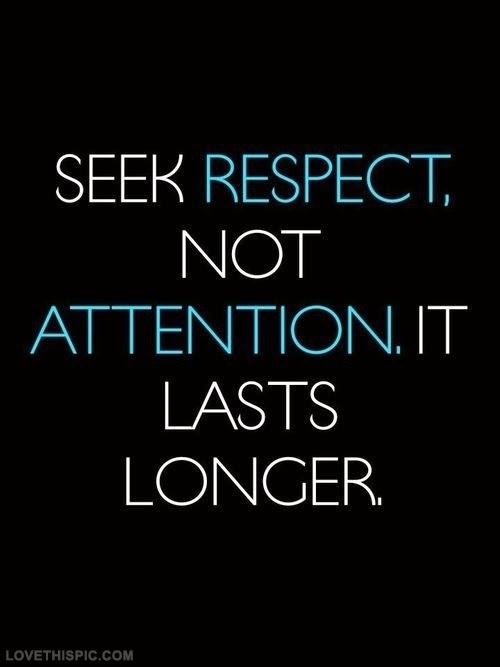 While attention is fleeting, respect will last a lifetime. I pray we will all teach our children that the respect of others is far greater than one fleeting moment of attention. Confession...ever since going gluten free, both #2 and I have missed eating Chinese food. So when we stumbled upon Damn Delicious' Blog and her recipe for the knock off version of Panda Express' Sweet Fire Chicken...we knew we had a winner. To see the recipe, click on the previous link. It was sooooo good. This recipe was super easy to adapt to gluten free. We omitted the green onions (optional garnish, as #2 is highly sensitive to them, but we kept the pineapple as I am only mildly sensitive to them and don't eat often). So yummy...we ate every last bit. And, she has many more delicious recipes we are looking to try. Most are super easy and quick to prepare. Perfect for school nights. Still cannot believe the kiddos are already back in school here!! I know y'all are awaiting the pictures of the house now that it has received a fresh coat of paint, but I need a day or two to finish up and get the pictures taken (the pinestraw is being delivered today, and my #2-the better photographer is sitting for her GRE). So, I thought I would at least share some pictures of the back porch since we managed to get it put back together this past weekend. View looking from top of staircase toward house. View looking the length of the porch out into our side yard. 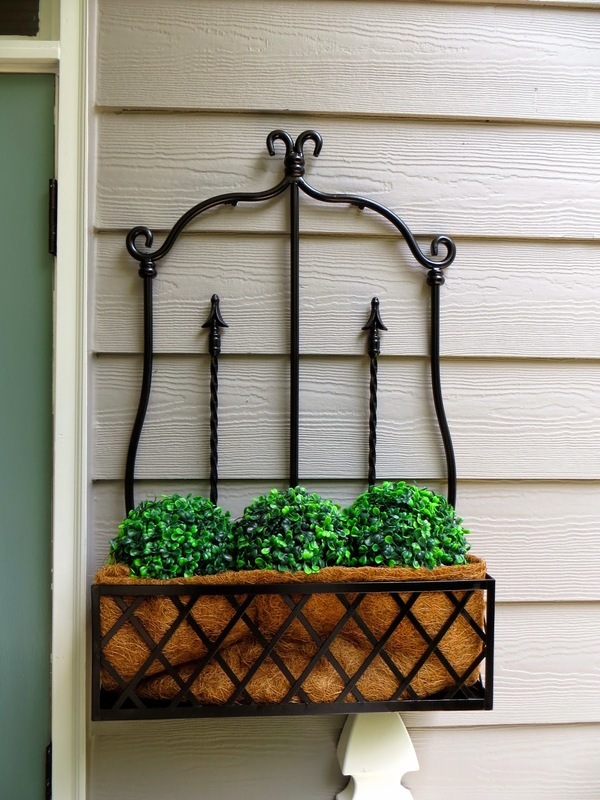 Faux boxwood balls are from Hobby Lobby. 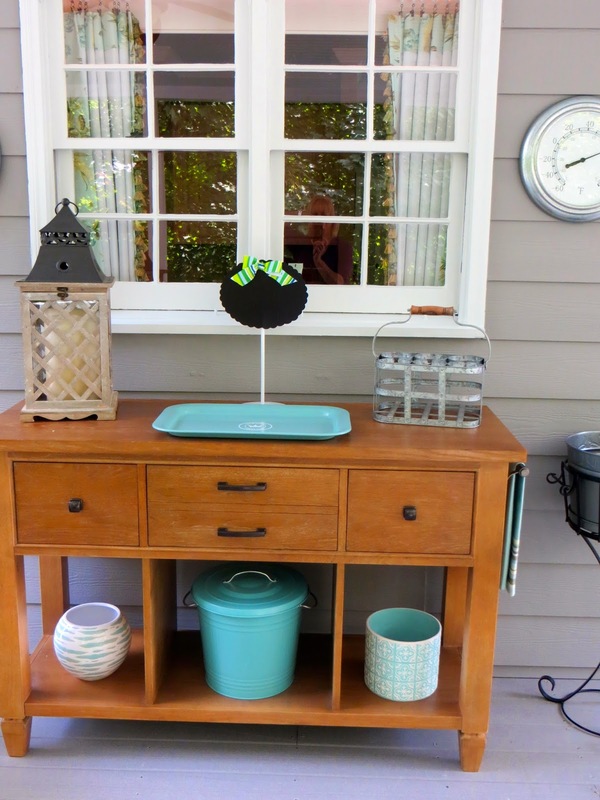 Bar-Home Goods, Lantern & Wine Bucket/Stand-Southern Living at Home, Tray and Trash can-Ikea, Planters-Home Goods, Bottle Carrier-Pottery Barn, Chalkboard w/stand-gift from a friend, Clock and Thermometer-Lowes. 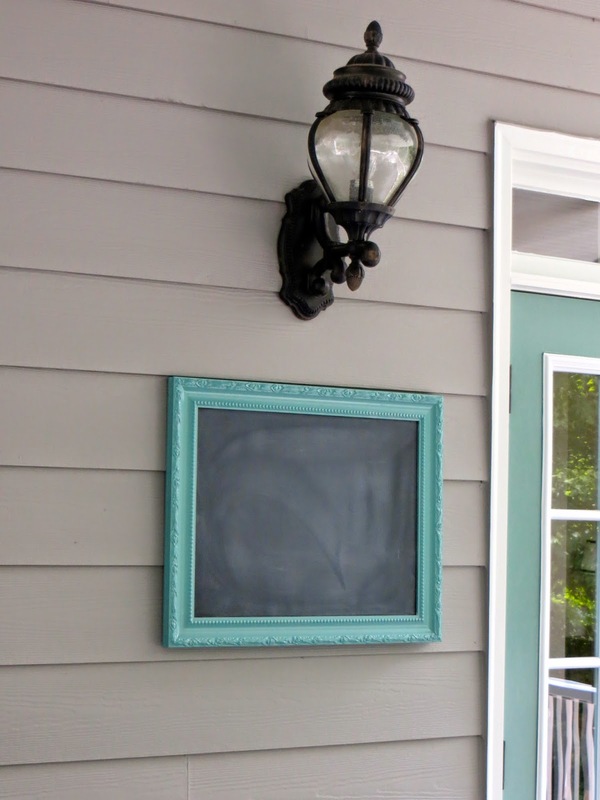 Chalkboard-repurposed frame I had with spray paint I also had on hand. The chalkboard cut to size was purchased at Home Depot (no spraying this time). 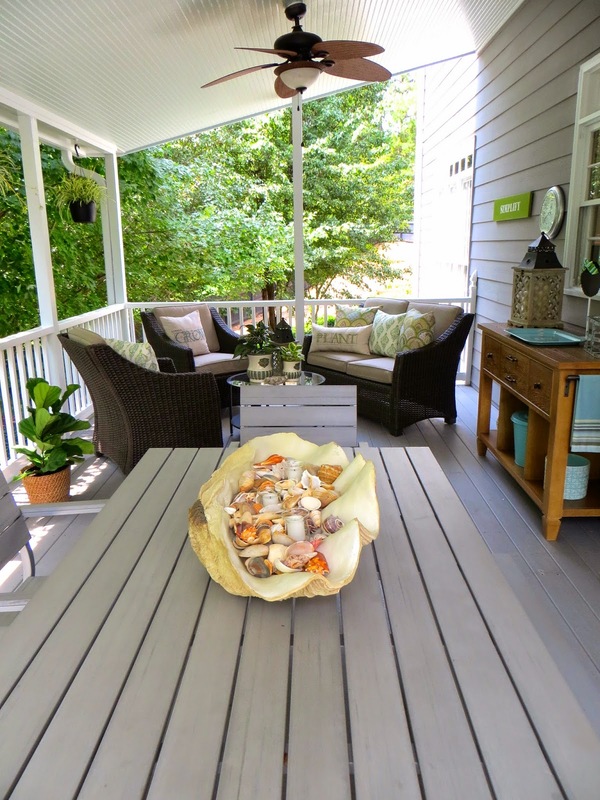 Giant Clamshell-Wisteria, Shells-gathered over time on beach trips, Battery operated weather resistant votives-Target. 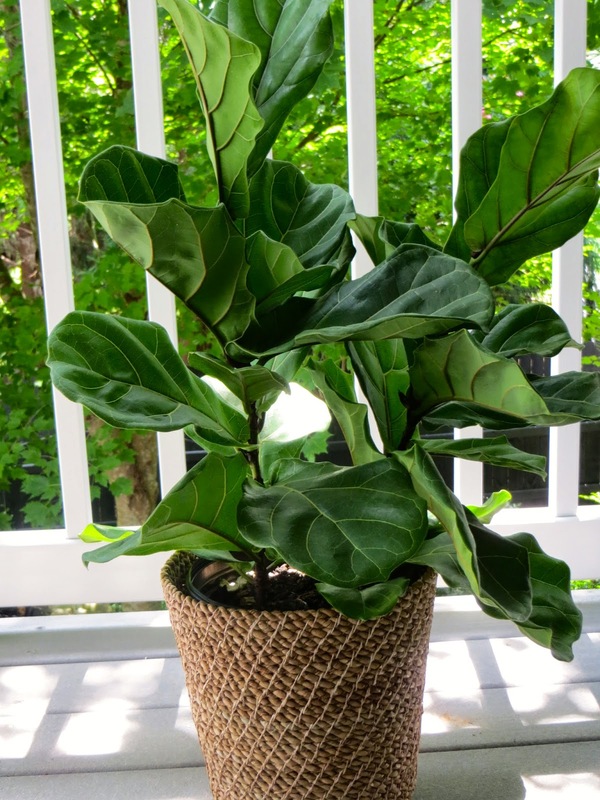 Fiddle leaf fig-Home Depot (it loves it out on the porch), Basket planter-bathroom trash can from Target. We have three spider plants purchased at Lowes hanging from the porch. Sign-painted by me. The simplify is a vinyl applique I purchased awhile back from House of Smiths. Love seat-Target, Throw Pillows-Pottery Barn. We have two matching chairs as well (you can catch a glimpse of them in the photo below. 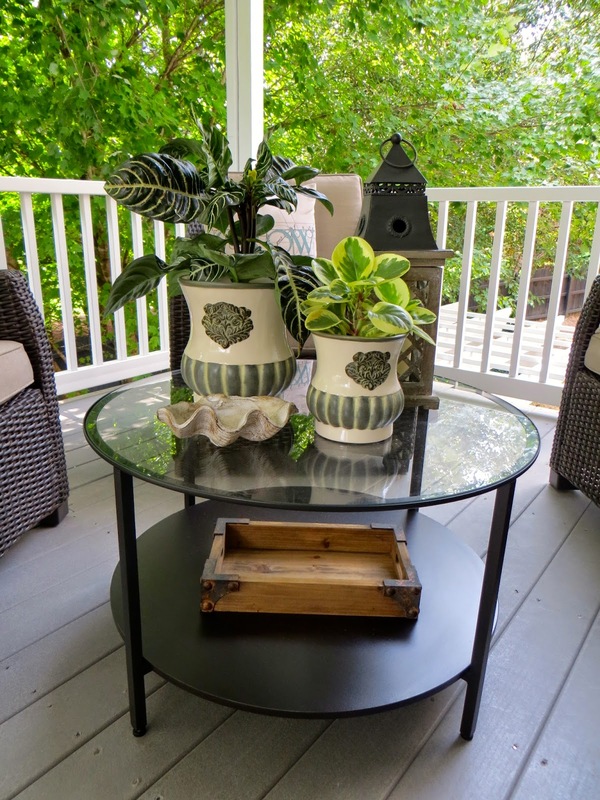 Table-Ikea, Lantern and Planters-Southern Living at Home, Clam Shell & Wooden Tray-Home Goods. We are thrilled to finally have all the window replacements and painting behind us and are looking forward to enjoying many more summer afternoons out here.